I like a man who is serious about sweets. Giuseppe Trapani, a 4th generation torrone maker in Sicily, fits the bill. When he welcomed me into the Torronificio Trapani, he’d already been at work since 4.00 am preparing the first batch of his secret family recipe for torrone. Since torrone is a traditional sweet in Italy at Christmas time, Giuseppe’s Christmas season begins the first of October, when his torronificio goes into high gear, making 2 batches of torrone a day. That’s about 70 kilos (155 lbs) of torrone, which seemed like an enormous amount to me, but Giuseppe told me that it had already been reserved for customers. In the spotless kitchen of the Torronificio Trapani, the air is suffused with the fragrance of honey. Several people sat at a marble table busily wrapping tiny chocolate-covered torroncini, big pans of toasted almonds were being pulled out of the oven, and a machine held a huge mixing bowl where a combination of honey and egg whites was being heated and stirred, becoming a thick white cream. I’d stepped into torrone heaven. I’d already done extensive tasting of almond nougat from some very good artisan torrone makers (forget the commercial ones, which are like eating a sickeningly sweet sponge mixed with sawdust and ersatz flavorings) but when I first tasted Torrone Trapani, it was clearly the best, and I was here to get to the sweet heart of the matter. Giuseppe explains what makes his torrone so good: high quality ingredients and no skimping on the almonds. (Of course, there is also the secret to his recipe, which he isn’t revealing.) 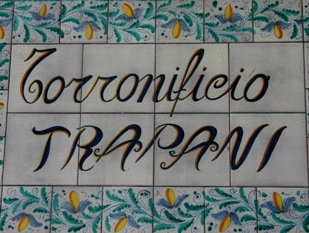 While some large-scale commercial producers of torrone use as little as 10% of almonds in their product, Torronificio Trapani uses close to 70%. The almonds are locally grown, not the cheap imported ones, or the California almonds that Giuseppe pronounced to be “woody and tasteless”. His almonds come from the highly prized almond varieties grown near Noto, and they are slowly toasted to a rich golden brown. The honey he uses is also local, from the Sicilian town of Sortino that has a long history of honey-making that follows the seasons of blloming flowers. The honey used in these torroni is fragrant of orange blossoms, which contributes to the torrone’s unique taste. Compare this to the commercial versions that are often sweetened with corn syrup, and you’ll taste the superior difference immediately. Giuseppe was constantly on the move – in fact he never stood still long enough for me to snap his picture – checking the consistency of the batch in the mixer, making sure the almonds are toasted to perfection then added at just the right temperature, and that each chocolate-covered torroncino is cooled properly before wrapping. I am beginning to see that the real “secret” in the recipe is Giuseppe’s know-how and constant vigilance, as he strives to make every batch of torrone consistently perfect. Giuseppe’s Aunt Maria is helping out. 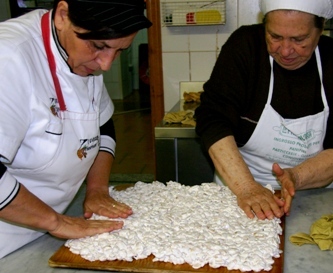 She has been making torrone for 30 years, though she admits that she no longer likes to eat it. Don’t worry, I think, I’ll eat your share. She remembers when all this work was done by hand – heating the honey and egg white mixture over a coal fire in a big copper pot, and stirring the mixture for several hours. “Difficilissimo,” she says, sounding tired at the mere thought. Then the pots were scrubbed with ashes and lemon juice, and polished until gleaming with a white cotton cloth. She shakes her head in wonderment. In 1986, Giuseppe asked an engineer to design a machine that would mimic his hand movements as he mixed the honey and egg white mixture, and this helped him increase his production with a larger batch that couldn’t be mixed by hand. 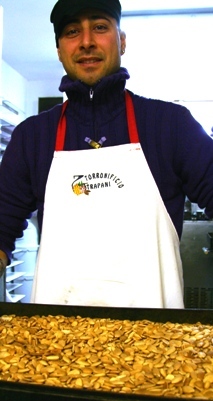 Then in 1996, he decided to investigate the use of the machine that he now has on the premises, to see if he could replicate his torrone with a device that both mixed and heated. He traveled to Milan to try out the machine, mixing his batches of torrone and adjusting the temperature and paddle of the machine until he was satisfied that he could make the same excellent caliber of torrone. Only then did he buy the machine, which allowed him to double his production. There is still a lot of hand work involved in Giuseppe’s torrone business. When Giuseppe pronounces the torrone in the mixer ready, the staff snaps to attention and works like a well-trained relay team. 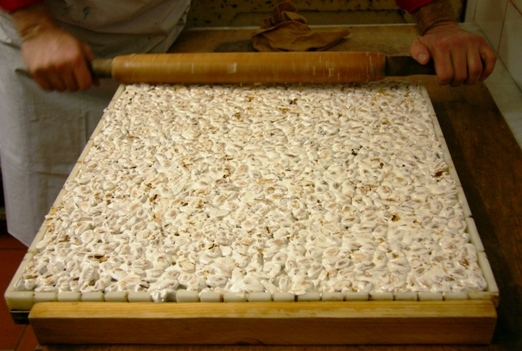 One fellow piles the warm nougat mixture on a wooden board on a scale. When the needle hits exactly 7 kilos, he passes the board to a table, where 2 people pat the nougat down into an even layer, then pass it to Giuseppe. He inverts the mixture into a shallow rectangular mold that was previously lined with edible wafer paper, then vigorously works a rolling pin over the torrone mixture until it uniformly fills the mold. He places the mold on a rack and another person covers it with wafer paper, and lets it rest. This procedure is repeated nine times. The cooled nougat is then cut – first with a machine that scores the torrone, then finished by hand with a pizza cutter – which releases an intense aroma of toasted almonds. Mixed with the sweet fragrance of honey, the air becomes almost edible. 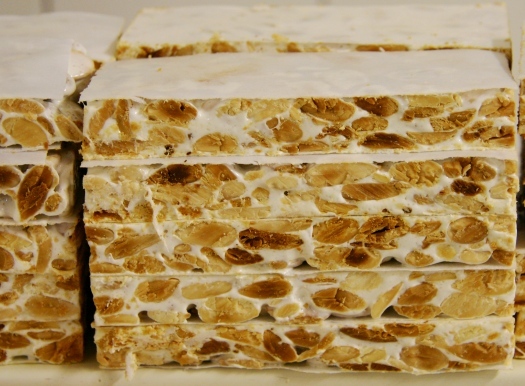 Torronificio Trapani’s classic torrone bianco is available with almonds, a combination of almonds and pistachios, with hazelnuts, or as individual almond torroncini, covered in dark or white chocolate. New in 2018 is an almond torrone infused with saffron, that gives it a yellow color and an unusaul falor. I stocked up on a variety before stepping out into the disappointingly sugar-free air. Before I got to my car, I’d already unwrapped a torroncino. The dark chocolate coating was paper thin, just barely beginning to melt against my anxious fingers. And inside, oh my. It was packed with crunchy almonds, toasted to perfection, with just the right amount of creamy filling holding it all together in a sweet embrace. Torrone heaven. 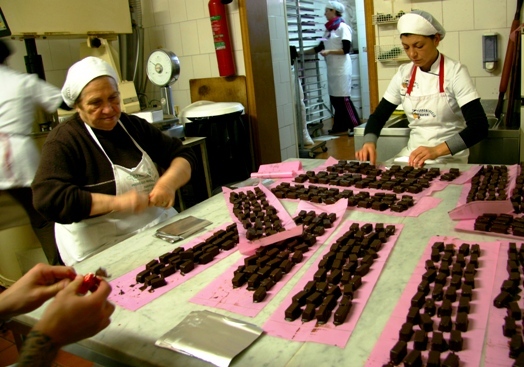 Torrone Trapani can be found in several pastry shops in the area – Pasticceria Di Pasquale in Ragusa and the wonderful Rosy Bar in the Sacro Cuore district of Modica, though often only stocked during the Christmas season. Because shipping from US to Italy is very expensive and very slow, I would like to buy Torrone in Italy and send to my relatives in Italy. How can I purchase Torrone and pay with Paypal or Mastercard credit card? Hi Mary – I don’t deal in shipping torrone, but you might contact the Torronificio Trapani directly. 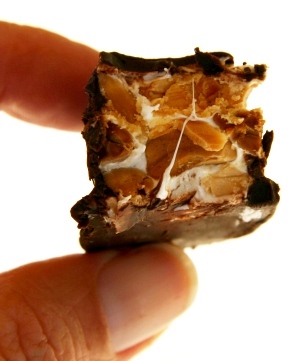 You should be able to find Torrone through a specialty foods store in the USA. Maybe try Zingermans? Could you please advise on how or where I could purchase some of this terrone within England – does any shops or stores sell it that you know off? Can’t wait to taste this stuff-living in California where almonds are an important harvest, i would love to see how the ones in the torrone compare. As a Californian who eats lots of local almonds it was interesting to hear the opinion of a Sicilian regarding their seemingly inferior quality. Once in Florence I tasted fresh torrone and was truly amazed at the difference from what I generally find in CA. I am looking forward to a trip to Sicily next year and can’t wait to eat this wonderful treat!! OMG how did we miss this?!?!?! Oh, wait, my eyes are still glazed over from that calda freddo. And pizza with the lovely man who took us in the back to his wood-fired oven. I used up most of my Italian words, apparently successfully, and so he talked to us at length…in Italian. Seek him out, small family spot on Corso Italia, I emailed you the photo.